"A jewel on the ramparts"
Property 7: "A jewel on the ramparts"
Beautiful apartment at Port with stunning river views. Property 9: Beautiful apartment at Port with stunning river views. 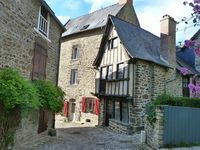 Property 36: Apartment "The Medieval"
Property 41: Newly renovated apartment in the center of medieval Dinan. This apartment was elegant, superb in terms of locations, and really well set-up. The beds were extremely comfortable which is really important to us, and the two bedrooms are really quiet (located at the back of the apartment); we even asking for an extra mattress on the floor for our 4 year old and that worked really well in the 2nd bedroom. Both the kitchen nook and the main dining table were great options for meals, and the kitchen was modern and surprisingly roomy. 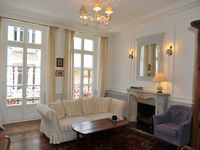 We were traveling with two small children (4 and 6 years) and this apartment worked out really well for our 11 nights in Dinan. Plus, I highly recommend paying the extra (minimal) charge for the underground parking. The location of the apartment is amazing. The river Rance is a mere 60 second walk away. We had immediate access to historic Dinan and didn't have to worry about driving or parking. There are numerous restaurants along the river, and the grocery stores are less than 5 minutes away by car. Check in and check out were seamless. There are many other sites to see in the surrounding area if you have a car. It was a great vacation for us!